For Professor Eric Grosfils, the rim of Amboy Crater is the perfect place to introduce students to the joys of geology. More than a decade ago, when Geology Professor Eric Grosfils first started bringing students to Amboy Crater in the Mojave Desert, he dreaded the last stretch of the long trip, each time hoping the rough dirt road and unpaved parking lot had not been washed out in a storm. Fortunately, the path always was intact and the three-hour bus ride always worth it, Grosfils says, because the strikingly symmetrical cinder cone volcano offers such an accessible, boots-on way to teach introductory students about the basics of volcanology. Grosfils takes students to the crater during the first few weeks of his introductory geology class, which he teaches with a planetary emphasis. The idea is to give them access to a very obvious volcano that they can roam and get a sense of the scale of things. While up on the rim, he asks the students to look out at the surrounding desert plain and imagine what they would have seen if they had been standing there watching when Amboy first erupted. He has them estimate the thickness of the basaltic lava flow, and later in the term they consider what shape it would take under the conditions of another planet. On Mars, for example, with all other conditions the same, the lighter gravity would most likely lead to a much taller, though less extensive, volcanic flow. For your trip, you can get a little more down to Earth, taking notice of the two nested areas inside the volcano, evidence of two smaller and later eruptions. You also can figure out the direction of the prevailing winds by noticing the absence of sand on one side, a wind streak (also visible to orbiting spacecraft, like similar features on Mars) that forms on the downwind side of the volcano. 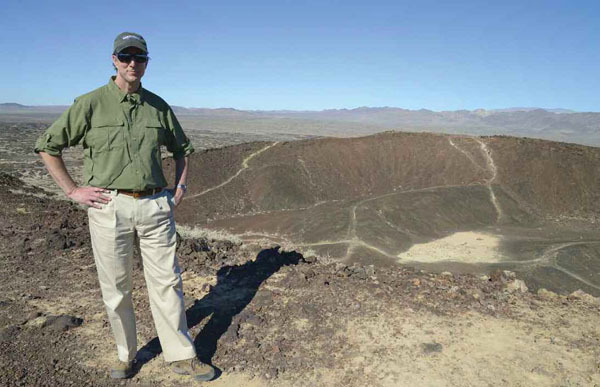 Amboy Crater’s relative youth—Grosfils says that recent estimates put it at anywhere from 7,000 to around 80,000 years old—makes it a great, unblemished example of a cinder cone volcano. But even if you hear explosions and rumbling, rest assured the dormant volcano is probably not the culprit. The boom-boom-boom is likely coming from the Marine Corps bombing range to the southwest, so, along with taking the usual desert heat precautions, make sure you know where you roam.